Video games are a vast market with 2015 sales predicted to be $111 billion, significantly larger than the market for movies. There are two generalized types of video games: large games that typically run on consoles or computers and casual games, a new category of easier to play games pioneered by Nintendo that are lower cost to develop. 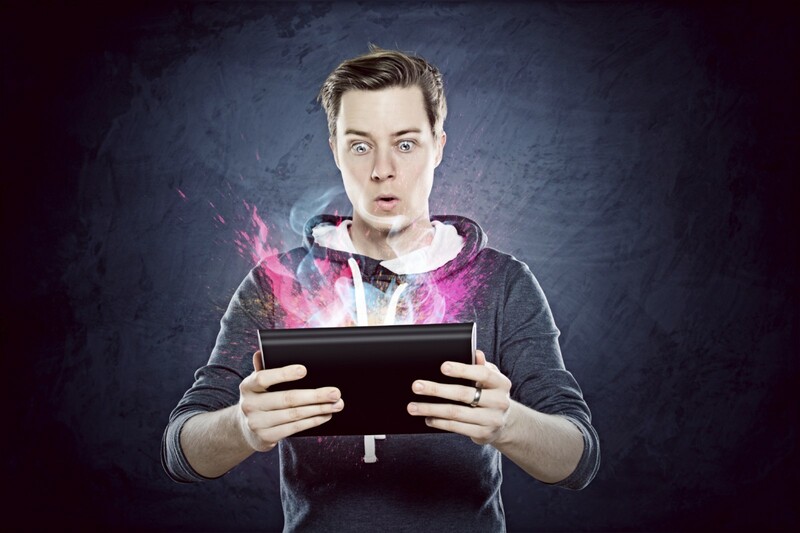 Mobile phones and tablets are the latest game distribution method and growth in mobile gaming is exploding; mobile games are expected to be, by far, the largest segment of the video game market in 2015. Just as food attracts sharks money attracts competition and the video game market — despite that it largely grew from Nintendo’s blue ocean strategic moves like the DS and the Wii — has now, ten years on, turned into a red ocean of competition: it is no fun to compete in the market for fun games. One mobile game standout that defied the red ocean and made competition irrelevant is Game of War, by Palo Alto based Machine Zone. Launched July 25, 2013 Game of War became immensely popular and immensely profitable. One year after launch Machine Zone participated in a private offering where the company, which no longer makes other games, raised $250 million on a valuation of $3 billion. Gamers were spending annualized revenue of $600 million, for a game that is free to download, one year after launch. Game of War is the second highest grossing app in Apple’s app store, surpassed only by a much older game. How did they do it? To break out of the red ocean of bloody competition, Machine Zone redefined the market itself pursuing a classic blue ocean strategy. 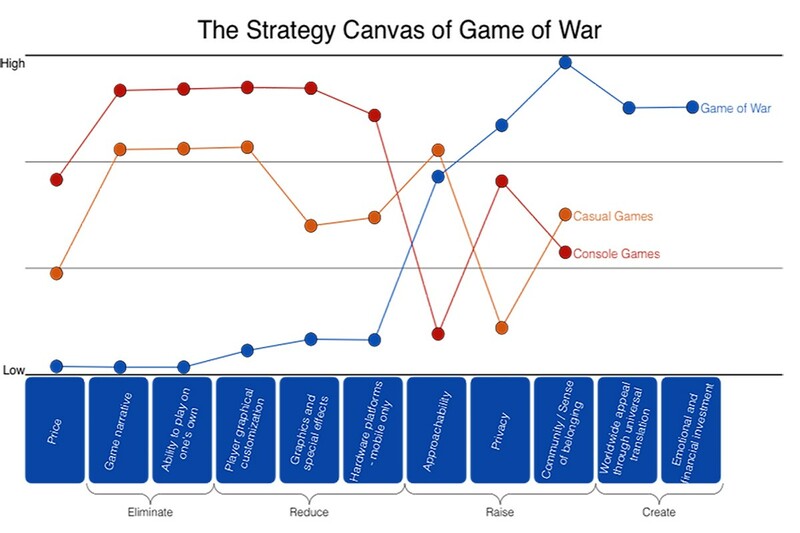 The exhibit, “The Strategy Canvas of Game of War,” allows us to highlight in one simple picture just how Machine Zone changed the playing field of strategy to unlock a blue ocean of new market space and strong profitable growth. Machine Zone focused extensively on building a worldwide closed community that could be controlled to maintain a higher user experience, in the same way that Apple exerts more control in an effort to do the same. “We effectively built a real-time Facebook network and added a game on top of it,” said Machine Zone CEO Gabriel Leydon. In order to foster worldwide collaboration Machine Zone created a universal translator into their games that handles 32 languages: gamers type in their native language and their words are instantly translated into other players’ native languages on their phones and tablets. For example, if a player has their phone set to English and types “Let’s attack that other alliance” it will appear on the phone of a player whose phone is set to French as “Attaquons cette autre alliance.” “We realized that if we were creating one giant world we would need to deal with the language problem,” said Leydon. This cross-language appeal opened the game not only to a worldwide audience but also to people interested in other cross-cultural socializing even if they had little or no interest in gaming. By focusing on one worldwide community Machine Zone opened a sizeable group of noncustomers: people who wanted to play with others around the world but were blocked by language barriers from doing so. Real-time translators and social components raise value but also cost, so to compensate, Machine Zone reduced or eliminated other traditional gaming components. There is no narrative in Game of War: no movie-like script with high-end graphics. Game of War possesses no artificial intelligence: people play against other people. Even by the already lower standards of mobile and casual games the graphics are primitive: there is no animated fighting nor elaborate armies, just basic two-dimensional illustrations. There is hardly any customization: players choose from one of eight male or eight female icons to represent themselves and every players “castle” looks the same based on level. As being a hermit on one’s phone takes away the fun of the game — especially for the type of gamers Machine Zone hoped to and did attract — Machine Zone added steep privacy protections. Gamers have the option to tell others who they are but the game will never give their true identity away and the game is set up to discourage the use of one’s real persona. Unlike Facebook games, which use people’s friends to link them with one another and encourage more gaming, Game of War is an entirely self-contained world with no links at all to reality. Raising privacy decreases social risk so gamers are more likely to participate in the community, making the community itself more vibrant and attracting yet more participation. Game of War keeps players involved, encouraging them to make full use of the mobile platform to check in and play frequently, even if only for a few minutes over work breaks. Alliances are limited to 100 players and players are rewarded by how well their alliance does as a team, much like in real-life. So beyond some basic game rules, peer pressure keeps people active. Additionally there are some game-rule requirements to encourage active play: for example, without paying money to effectively buy protection like shields, people must return to the game at least every eight hours or their character can be hurt (but not destroyed: it is impossible to “die” in Game of War). That’s because you can turn on free protection for eight hours, whereby your character is effectively shielded, but not more. “Getting people into an alliance is more important to us than getting money from them,” Leydon said. While Machine Zone gives away its software for free, its freemium business model that charges for supplements ensures a steady stream of revenues as its social component drives players to purchase these supplements to enhance the value of the software. Building a large game is expensive but Game of War costs considerably less to create, and took substantially less time, than red ocean console games that earn less revenue. Game of War required a $16 million investment, financed by the venture community, and took 80 employees 18 months to develop. In contrast Sony estimates the average cost to develop a PS3 game is in the $20 million to $50 million price range. Take-Two, a large console game studio, said “top titles” cost over $60 million to develop. Disney Infinity cost $100 million to develop, Bungie’s Destiny cost $140 million, and a game called Defiance — based on a television show — cost $70 million, $30 million more than the budget for the television show. Star Wars: The Old Republic is community focused, as is Game of War, but cost $200 million to develop in 2011. Many of these titles, which usually retail for $50-$70, were successful but none added anywhere near $3 billion in market valuation after their release. By eliminating the expensive narrative, artificial intelligence, and vastly reducing graphics Machine Zone’s Game of War cost far less to produce while producing far more in revenue and shareholder value. This trait, differentiation and low cost combined to make competition irrelevant, is one of the key markers shared by all value innovation businesses that create blue oceans. Visit INSEAD Blue Ocean Strategy Institute and Blue Ocean Strategy website to learn more. 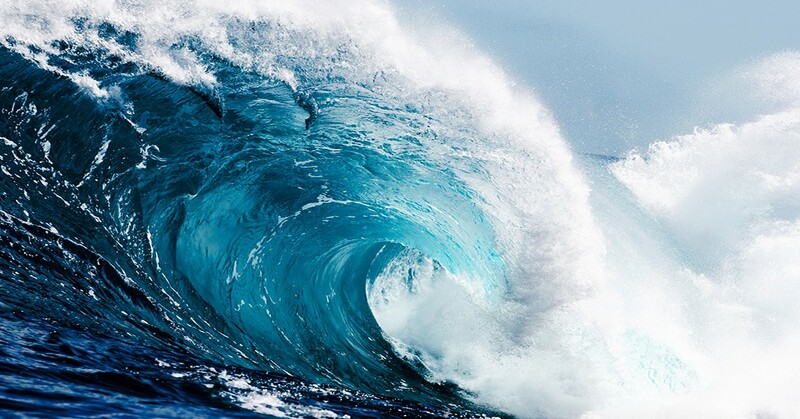 Sign up to our newsletter for the latest news on how companies, organizations, and non-profits are applying blue ocean strategy around the world. Drop us a line at news@blueoceanstrategy.com. We’d love to hear from you.